It’s happened time and time again on this blog that I’ve had to stop and reflect on just what a jerk Matt can be sometimes. He’s constantly late, he’s a habitual liar, and he’s often rude to the point of seeming completely insensitive to other people’s feelings. So, yeah, Matt is usually the one I keep picking on. The tables are turned a bit in Daredevil #189, in which Foggy Nelson and Natasha “Black Widow” Romanova conspire to break up Matt’s engagement to Heather Glenn. 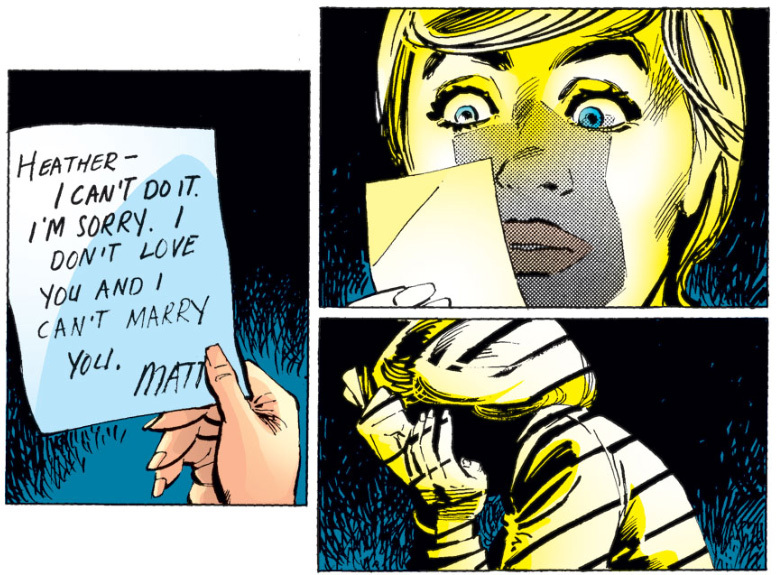 Matt’s and Heather’s engagement was sprung on presumably unsuspecting readers on the last page of Daredevil #183, and the decision must have seemed as strange to Matt’s fictional friends. 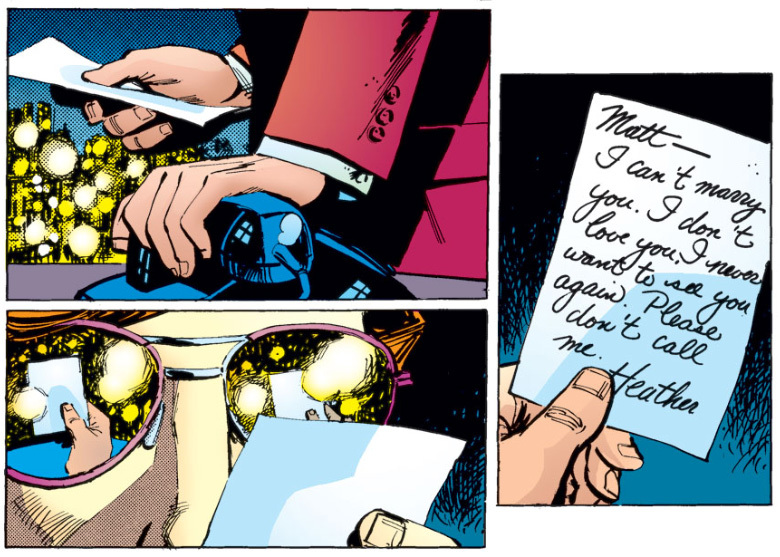 While Heather had been Matt’s primary love interest for some time, their relationship was troubled and, as Foggy points out, Matt hasn’t been nice to Heather but has actively tried to diminish her accomplishments. This scenario is not unlike the one from Bendis’s run on Daredevil where Foggy suspects that Matt’s marriage to Milla was due in part to Matt suffering from some kind of mental breakdown. 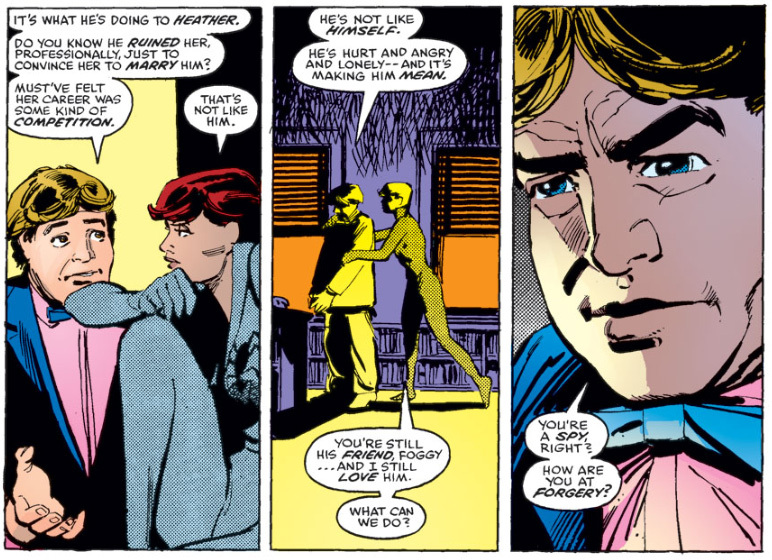 In this case, Foggy and Natasha carry out their plan of breaking up the troubled couple in a very cruel manner. Heather is the first to receive her note. A short while later, Matt comes home to find a similar note (in considerably neater handwriting…) from Heather. This is the kind of situation where you’d think Matt would be able to smell at least Natasha’s involvement since she was the one to write the note, but as I tend to be more forgiving of Matt being guilty of human error than his performing impossible tricks, I’m willing to let that one slide. Either way, Matt’s engagement to Heather comes to an abrupt ending and, as we know, things don’t end well for Heather Glenn. Foggy must have felt at least some guilt for her death, though I can’t recall if anything of that nature is ever expressed. I don’t think that Natasha’s and Foggy’s wee bit of treason was kept in check by further writers, even though Foggy looked quite forlorn when he went to Heather’s apartment to find her dead. It is a pity writers tend to forget these details: I think it could have made for a good secondary plot. It kills me that Matt never finds out about this.